I guess most aspiring writers have read ‘how to write’ books. The burgeoning selection on the shelves at Downie Towers can be a source of wise counsel, a comfort when things aren’t going well and a hopeless distraction when the real way forward to is to sit at the desk and put words on paper. Anyway, on Friday afternoon it was a delight to spend time in the company of a large number of readers plus Anne Perry, Susanna Gregory and Peter Guttridge – writers who have already faced these challenges and survived. Considering the amount I’d learned by the end of the day, I should probably have paid to be there. The only disappointment was that a scheduling mix-up meant Andrew Martin wasn’t on the panel. This was a shame because I’d really enjoyed reading one of his ‘Jim Stringer’ novels as homework and was looking forward to hearing from the man himself. An evening with Barbara Cleverly, Ruth Downie, Laurie R King and Manda Scott. The event’s being moderated by Michelle Spring. 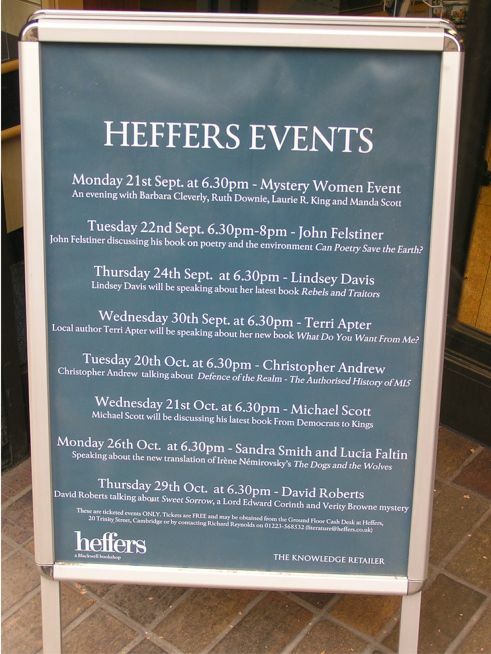 This link to Heffers site gives details of how to get tickets – not only for us, but for Lindsey Davis’s talk on the following Thursday. Looks like it’s going to be a good week in Cambridge. *Anyone want to swap recommendations? Interesting question, Toni. I know what you mean about the ‘write your novel by the end of the week’ books – despite plenty of good intentions, my own method of production is so chaotic they don’t seem to make much impression on it. Louise Doughty did a sensible ‘novel in a year’ series in the Daily Telegraph, though – it might still be on the internet somewhere. The books I’ve found useful tend to be less about systems and more about ways of approach – Dorothea Brande’s ‘Becoming a Writer’ is a classic, as is William Goldman’s ‘Adventures in the Screen Trade’. I’ve also done a lot of dipping into a collection of exercises called ‘Taking Reality by Surprise’ (edited by Susan Sellers). There are books that reassure writers they’re not going crackers (Julia Cameron is very wise), and ‘The Forest for the Trees’ by Betsy Lerner may help authors not to send their editors the same way. ‘Solutions for Writers’ by Sol Stein is good on how to get yourself out of the hole you’ve just typed yourself into – and yes, there are books on how to write crime novels. Thanks for the kind comments, Toni.